Range in size from 15 to 20 inches and weigh from 26 to 46 oz. 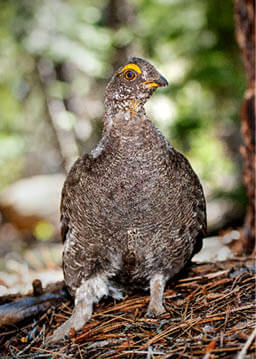 Dusky grouse inhabit central Nevada from around Austin, east to the Nevada/Utah border and north to the Idaho/Nevada border. 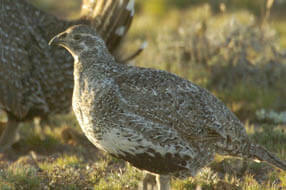 Sooty grouse inhabit extreme western Nevada along the California/Nevada border in mountain ranges such as the Carson Range, Sweetwater and White Mountains. 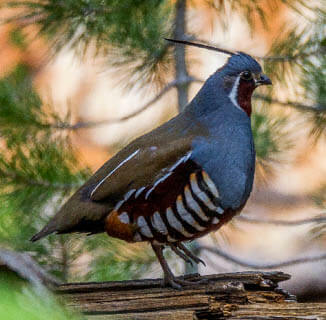 Nevada’s most popular upland game bird. Widely distributed across the state and much of the Great Basin. Coloration is grayish brown with a buff belly. Chestnut and black barring on flanks with a black line through eye connecting at the throat. Length is 13.4 to 15 in and weighs from 19-27 oz. Inhabits steep, rocky habitat exemplified by talus slopes and cliffs. Reddish-brown or gray with dark bars and spots. Weighs between 16 and 26 oz. and is much smaller than a blue grouse. Translocated populations exist in northeastern, central and portions of northwestern Nevada. Males are a strikingly beautiful bird with a distinctive green iridescent neck, red face and white collar around the base of the neck. The body has a copper coloration with black spots and the tail is long and pointed with black barring. 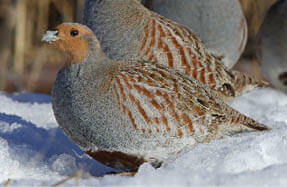 The female is dull brown in coloration with black spotting on the sides and a shorter tail than the males. Ranges in size from 19.7-27.6 in in length and weighs from 17.6-105.8 oz. 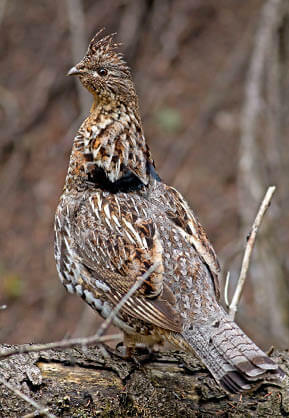 A large upland game bird introduced into Nevada in 1963. Ranges in size from 22-29 inches and weighs from 4.4 to 6.8 lbs. Gray in color with a white throat and chestnut stripes on the sides of the head. Sexes are monomorphic except for size where the female is smaller in stature. Only exists in Nevada’s Ruby Mountains and East Humboldt Range in North America. 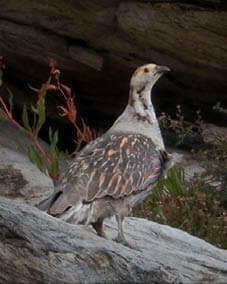 The mating display of sage-grouse is very distinctive as the males inflate large yellow air sacs surrounded by white pin feathers and create a series of odd plops and swishing sounds. Males also fan out their spiny tail feathers during the display. Their coloration closely resembles their habitat with a grayish brown appearance and white mottling throughout. Males can be almost twice as large as females. Range in size from 22-29.5 inches in length and weigh between 3.1-6.4 lbs. Lifespan is from 3-6 years with females tending to be longer lived than males. 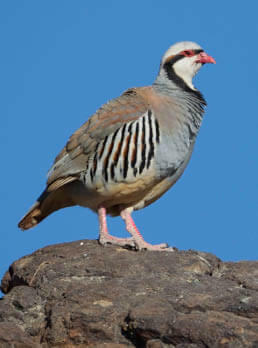 Officially known as the “Gray Partridge”. Ranges in size from 11.8 to 13 inches in length and from 13.6 to 17.6 oz. Grayish brown with chestnut barring on wings, dark reddish U-shaped patch on belly and a reddish throat patch. 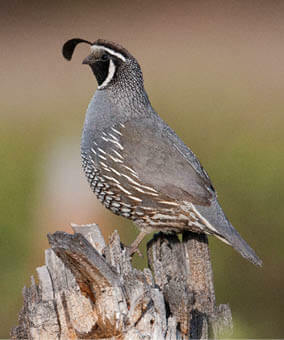 The top knot of this species is straight and long compared to California or Gambel’s quail. Chestnut throat patch and chestnut flanks with white bars are distinctive of this species. Ranges in length from 10.2 to 12.2 inches and weight from 6.7-9.2 oz. Distribution in Nevada includes Clark, Lincoln and Nye Counties. 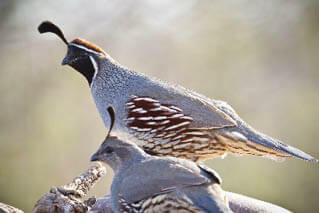 Similar in color pattern and size to California quail, but male Gambel’s quail have a prominent black belly patch. Range in length from 13.4-14.2 in. and weigh between 5.6-7.1 oz. Length is from 9.4 to 10.6 inches and weighs in at 5-8 oz. Males are distinguishable from females by the black face outlined in bold white stripes and the larger, comma shaped head plume or “top knot” while females are plainer brown and lack the facial markings and have a relatively shorter and fairly straight top knot. This species is often mistakenly called a “Snowshoe” rabbit. The summer pelt coloration is brownish with some black and can appear gray in color. This species turns white in the winter, but maintains the black tips on its ears. 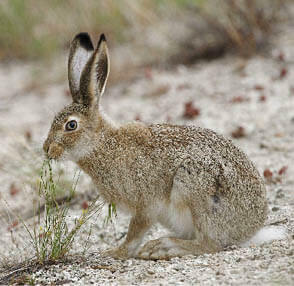 The tail is white, which is a distinguishing characteristic that differs it from the more common black-tailed jackrabbit. This is the largest rabbit in Nevada and is between 22 to 26 in. in length and weighs between 6.6 to 13 lbs. 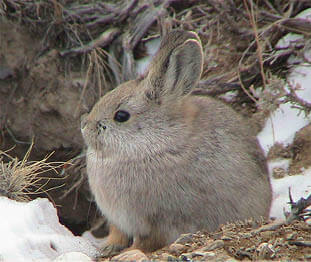 Nevada has two species of cottontail rabbits, mountain cottontail and desert cottontail. Ranges in size from 14 to 17 in. in length and weighs from 1.5 to 2.6 lbs. 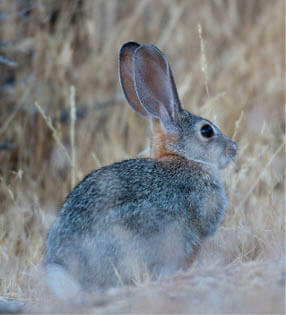 The ears are relatively short compared to jackrabbits and are smaller in size. The feet of cottontails are densely covered in fur. Overall coloration is pale brown with black-tipped ears, a white underside and white to grayish white tail. A sagebrush dependent species relegated to the sagebrush range in the western U.S. The world’s smallest leporid that weighs between 0.8 and 1.1 lb. and ranges in length from 9.3 to 11.6 inches. Has short ears, gray color, small hind legs and has no white fur on tail, a distinguishing characteristic from cottontail rabbits.